Digital agency and child care center will be first businesses into the Frontside project in Northwest Portland in early 2018. Adpearance, a digital marketing agency, and The Children's Garden, an early childhood learning center, will be the first tenants into Field Office, the Frontside District's experimental new development. Waterproofing is being applied to the shell right now. The tenants will move in in early 2018. Frontside is the name of the area growing along the banks of the Willamette just north of the west end of the Fremont Bridge. The area stretches up past Carton Service to Schoolhouse Electric, but mostly consists of new apartments, condos and retail. 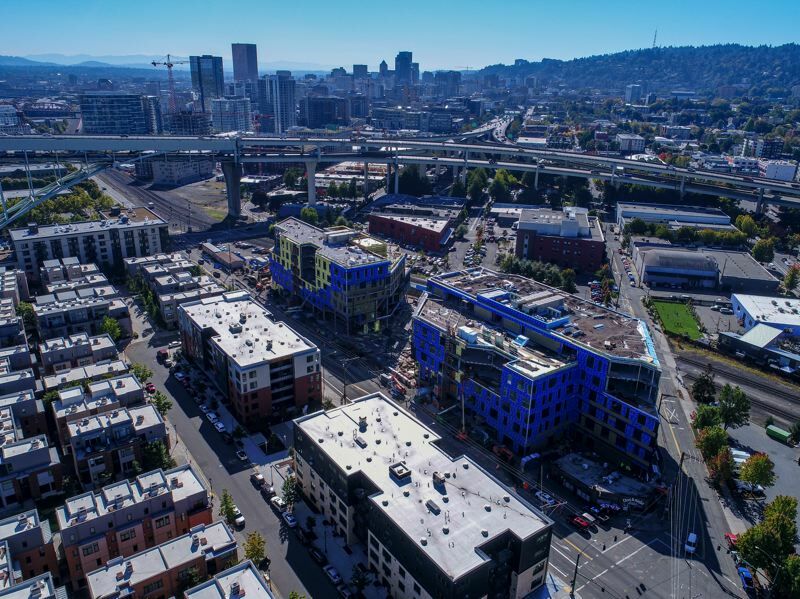 Field Office is the work of the developer project^, which is also behind the ad agency Swift's beguiling in Slabtown, and Framework, the 12-story mass timber building in the Pearl for Albina Community Bank. Adpearance will occupy 30,000 square feet in Field Office's west building. "We've grown a ton in the last few years and ...bringing the company together is really important to us right now," said Adpearance co-founder David Steinberg." We looked at a ton of spaces in the inner core and wanted to find a creative, inspired space that could accommodate 30,000 square feet plus on one floor so we could bring everyone back together." The company considers Field Office to be a "collaborative and innovative" building, especially the sunken common area and city views. Steinberg called it "an emerging neighborhood." The Children's Garden, is a locally-owned early childhood learning center which already has one location in Portland. Again, they targeted the neighborhood as a growing hub of activity. Even if not many children live in the North Pearl, workers commuting in can drop their kids there since it is well served by freeways and buses. "In our search for a second location, Northwest Portland rose to the top of the list as the neighborhood has become a hub of activity over the last several years and is easily accessible from all areas of the city", said Tessa Stephenson, Regional Director of Operations for Endeavor Schools and Executive Director at The Children's Garden. She said that Field Office will be the kind of beautiful place where children thrive. "The open spaces and skillful integration of natural elements make Field Office an ideal complement to our discovery-based style of early childhood education." Field Office will include two buildings with approximately 300,000 square feet of office and retail space. Its design includes a large walkway between two halves of the development. It abuts the Dockside Tavern, infamous as the place Tonya Harding and her boyfriend abandoned a trash bag containing evidence linking them to the assault on Olympic skater rival Nancy Kerrigan. "Adpearance and The Children's Garden are exactly the type of tenants we envisioned moving into Field Office when we were developing the concept for the project," said Jonathan Ledesma, partner at project^, Field Office's developer. He added that companies are looking for work environments that match their staff's lifestyles. "Field Office was conceived and built for companies and their employees that share an affinity for the outdoors and a culture of creativity." Field Office is a first-in-Oregon investment for National Real Estate Advisors, an investment manager. National Real Estate Advisors develops assets for institutional portfolios of apartments, office, mixed-use, industrial, data centers and hotels with design features, technological enhancements, and amenities that can drive high tenant demand and create value for investors. The firm is a subsidiary of the National Electrical Benefit Fund.